Divorced from his first manager, he appears to have acquired a zen-like control over his game and his emotions. His opening 66 in the Dubai World Championship - completed with a back nine of six under par 30 - was a thing of beauty. But it wasn’t just the sensational ball-striking or the string of putts he holed from all sorts of distances but the way he reacted to his birdies on the back nine. Outscoring his Race to Dubai rival Luke Donald (72) by six strokes puts him in the driving seat psychologically with 54 holes to go in an event he must win if he is to top the money list. Yet barring the fist pump that accompanied his final birdie, he appears determined to keep a lid on his emotions in what is developing into a fascinating battle with Donald for the European No 1 crown. Whatever happened at Atlanta Athletic Club, or in the aftermath of that tournament, it appears to have worked wonders for McIlroy. Ranked fifth in the world after the final major of the season, he’s moved up to second thanks to a stunning run of results. Apart from the PGA Grand Slam of Golf, where he fell away on the last day, his last seven individual tournament finishes have a Tiger-esque look - 3rd, 3rd, 2nd, 2nd, 1st, 4th, 1st. The fourth place finish came in the WGC-HSBC Champions and the fact that McIlroy confessed that he was “disappointed” not to have finished higher there says it all about his current state of grace. “I definitely don’t feel invincible, but I feel every time I tee it up I have a good chance of shooting a good score,” McIlroy said. McIlroy’s low key attitude might have something to do with the fact that he’s still not over his virus and knows that the magic spell might be broken at any moment. On the eve of the tournament, Donald said McIlroy was more talented than Woods before rectifying through Twitter and saying that Tiger was the greatest player he’d ever played alongside. McIlroy is never comfortable when he’s put on a pedestal above Woods or Jack Nicklaus. So it was no surprise that he played it all down afterwards. “Look, it’s one thing to have talent but it’s another to actually have the capability of turning that talent into something productive. I think what Luke was saying was maybe I’m — golf comes as easy to me as it does for Tiger. I’ll never know, but, look, Tiger’s won 90-whatever tournaments worldwide and 14 majors and that’s definitely more of a talent than five wins and whatever it is. “Yeah, there’s different types of talent. You could say some of Luke’s short game shots out there today were unbelievable. He’s definitely got more talent than me around the greens. 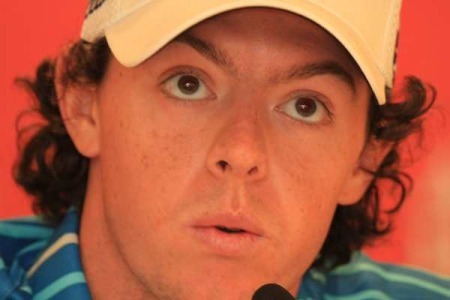 Right now, McIlroy is freewheeling. He’s playing the “mindless” golf that brought him a 61 at Royal Portrush, a four-shot lead after 54-holes at Augusta and an eight-shot lead with a round to go at Congressional. “When you get on a roll like this, it’s nice. You don’t really have to think about it too much. You’re just trying to hit the green and hit the fairway and hole the putt and go on to the next hole. Everything seems sort of stress-free, and I don’t want to say easy, because it’s not, but it’s definitely nice when you get on little runs like this. Peter Hanson shot 64 - “I think it’s the best golf I’ve played” - to lead by one from Paul Lawrie and by two from McIlroy. Shane Lowry shares eighth after a 69 with Graeme McDowell (71) tied 21st, Michael Hoey (75) 48th and Darren Clarke (76) in 53rd. Donald is 28th and under no illusions about the task facing him in an even where he needs an eighth place finish to be mathematically certain of adding the European money title to his US crown. “I didn’t expect anything less,” he said of McIlroy’s sensational start. That was then. 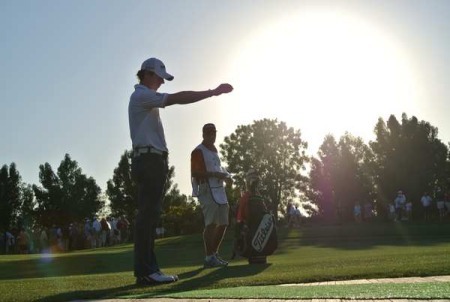 Rory McIlroy drives at the seventh in the third round of the inaugural Dubai World Championship in 2009. Picture www.golffile.ieRory McIlroy might be suffering from a mystery virus but won’t mentally “bug” rival Luke Donald in their Race to Dubai showdown. Rory McIlroy is confident he’s the best player in the world. 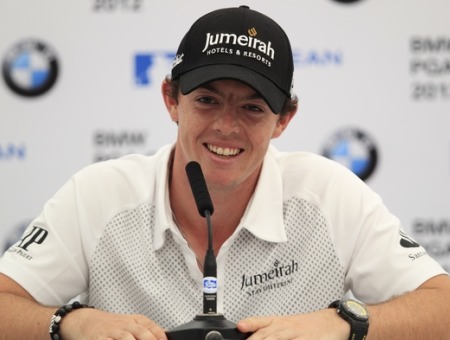 Picture Fran Caffrey www.golffile.ieRory McIlroy takes on a press conference the way he takes on a golf course. Like it or not, he sees the shot, wastes little time over it, and gives it a lash.